Once again, M&T Bank grants the Westchester Community College Foundation $10,000 renewing their scholarship support. The M&T Bank Scholarships are awarded to students enrolled in business curricula who demonstrate community involvement, academic achievement, and financial need. Since 2013, thirteen students have benefited from their generosity. This year another four students have been selected for the fall 2018 semester. Frank Micalizzi, Regional President and Steve Cavazuti, VP for Government Banking presented the donation on behalf of M & T Bank. 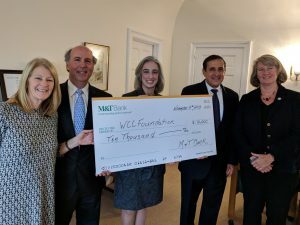 The WCC Foundation is grateful for M&T Bank’s loyal support.